Specifically, while carbon-fiber skins still form a sandwich around a foam core, the thickness of the cone is now variable. This technique confers additional stiffness without adding a lot of material costs. 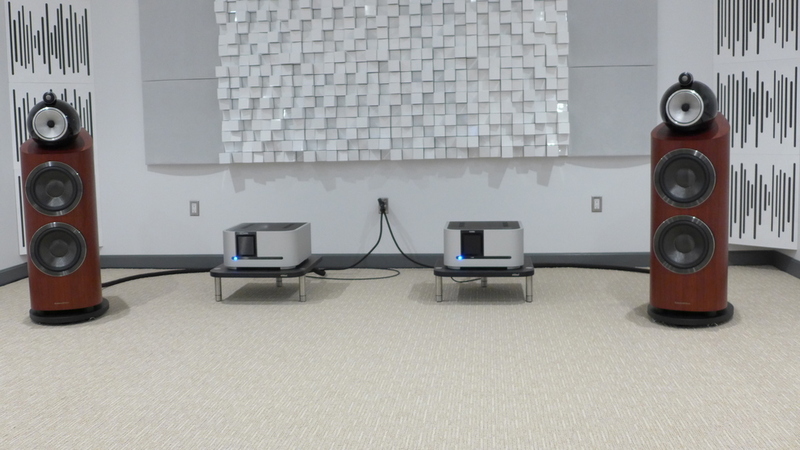 The use of pure aluminum for the plinth (the metal structure at the base of woofer) in place of the 802’s zinc-aluminum plinth results in a woofer that’s actually lighter than its smaller brother. Combined with an entirely new suspension, voice coil, dust cap, and cage, the new design achieves virtually perfect pistonic motion within its range, according to B&W. The benefit can be seen in the 800’s strikingly lower distortion figures: 10db less second-order harmonic distortion, and a whopping 20db lower third-order harmonic distortion. It’s important to note that these reductions favorably impact not only bass but the midrange as well. That may seem counter-intuitive, but those second- and third-order artifacts appear smack dab in the midrange. B&W’s plan, then, was to reduce woofer distortion not only to benefit the low end, but to improve midrange purity as well. Because B&W had no 802’s on hand for our demos, I can’t tell you if the flagship has audibly—as opposed to measurably—lower distortion. However, I can attest that the 800 D3, as driven by Classé CA-600 monoblocks, is an effortlessly transparent speaker. Further, despite those larger woofs, the new speaker’s defining virtue may well be its impressively clean attacks, which are evident from top to bottom. Whether it was a kick-drum, Sonny Boy Williams snapping his fingers, or Dead Mouse’s synthesized dance foundation, the 800’s transient crackle was marvelous. I can also attest that the new flagships can play very, very loudly without even a modicum of strain. In a separate room, B&W offered a five-channel surround configuration. Several of the home-theater writers present looked around and remarked disapprovingly on the absence of a subwoofer. Once the music began, though, it was obvious that none were needed. Indeed, I can’t imagine a sub adding anything to the bass horsepower of the 800’s, and no sub in my experience can match the 800’s stop/start prowess. While the demos made it clear that the 800 D3’s can deliver plenty of bass punch, in both demos the bass pitch was not especially well defined. For now, I’m chalking this up to the listening rooms, which seemed to be summing all the bass frequencies somehow. Although carefully designed and constructed, the spaces were completed literally the day before we arrived. B&W noted that the tuning process was still ongoing, so even though the 800 made a thoroughly impressive outing, I expect that process will improve things even further. B&W’s Diamond Series 3 launch heralds a new era for the company. Now the line is complete, capped by the innovative 800 D3. The new flagship gives every sign of being a significant step upward—and forward. I’m hoping to be able to evaluate it in my own system and listening room very soon. When that time comes, I’ll give a full report.